This is the standard version with cardstock characters. 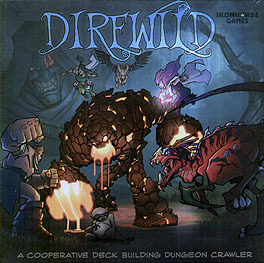 Direwild is a hostile place, inhabited by various clans. Each clan was led by heroes called Animists. These heroes could summon the creatures of the Direwild to aid their clan. During a clan war, a clan was destroyed that was led by the Animist Karn. Karn survived and strove to grow strong enough to end all the clan warfare. Karn willingly sacrified his humanity for power and soon justified destroying all other clans in an effort to "bring peace." Years into his rule, Karn's minions roam the Direwild and only a few scattered clan heroes remain. These last heroes have banded together, but will their combined power be enough to defeat Karn and his minions? Completely co-operative game! All enemy actions in the game are controlled by AI cards. 2-4 players will choose from 10 unique heroes! Purchase creatures for your hero to battle with! Combine them to create even stronger creatures! Move your heroes tactically throughout the lands. Discover enemies! Attack as a team! Use the terrain to your advantage! Find treasure!